Aurora Award-winner Helen Marshall is an author, editor, and self-proclaimed bibliophile. As a Ph. D candidate at the University of Toronto’s prestigious Centre for Medieval Studies, she has presented widely in England, Canada and the United States on topics ranging from the width of medieval punctuation to fourteenth-century romances. In 2011, she published a collection of poetry, Skeleton Leaves , that “[took] the children’s classic, [stripped] away the flesh, and [revealed] the dark heart of Peter Pan beating beneath.” The collection was jury-selected for the Preliminary Ballot of the Bram Stoker Award for excellence in Horror, nominated for a Rhysling Award for Science Fiction Poetry and won the Aurora Award for best Canadian speculative poem. 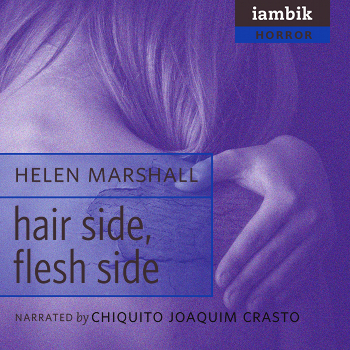 Recently she released Hair Side, Flesh Side , a short story collection about history, memory, and cost of creating art. Her poetry and fiction have been published a range of magazines including Tor.com, The Chiaroscuro, Paper Crow, Abyss & Apex, and Lady Churchill’s Rosebud Wristlet.